To Celebrate Your Little Cowboy! Cut the shape of a cowboy hat out of brown, pink or blue card stock or scrapbook paper. Glue to white poster board and write the invitation details on the back. Oh Baby- Hand out a piece of paper to your guests. 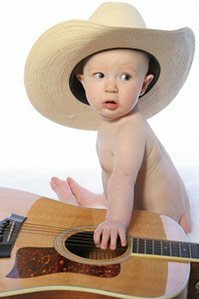 Have them write down as many songs as they can think of that have the word baby in it. The person that can write down the most songs in the set amount of time wins a prize. Bloomers Game- Wrap a beautifully girly box and pass around the room to cowboy music. Let everyone know that the gift box contains bloomers and whoever ends up with the box at the end will have to wear the bloomers. This is a gag game, so the person who opens the box will find a flower corsage to wear. Cowboy Training- Time to domesticate your cowboys. This game will help get rid of the bow legged walk. Use a balloon filled with air for guests to place in between their knees (a water balloon can be used if outside). Have guests race from one point to another. The first person to finish with the balloon still intact wins a prize. Cowboy Hat Toss- Give your guests a try at throwing a cowboy hat in the style of the Old West. They can try their luck at tossing the cowboy hat onto baby bottles. If they actually land on one...they get a prize. Serve your guests western style with cornbread, chili, chicken wings, potatoes, chips and salsa. You can also give the shower an old fashioned touch with homemade root beer or ice cream or spice it up with a salsa bar with different kinds of salsa. If your baby shower is held outside, you can use hay bales for seats. Any western or cowboy decor would work great for this theme. Cut napkins out of material with a bandanna design on it. Fill the space with hay bales, cowboy hats, saddles, cowboy boots, country western memorabilia, ropes, bandannas, camping equipment, and anything else you might have that has a little western flavor to it. Take a large cowboy hat or boot and place dry floral foam inside and arrange either fresh or silk flowers in it. If you are using fresh flowers, you can wet the floral foam a few hours ahead of time and the flowers will keep well. Fresh Flower Tip:-Pick up a hat or boot to use at a thrift store so you are not worried about ruining someone's prized possession. Thank you for chews-ing to come to the baby shower. Love hostess, mom, dad and our little spitfire! Or you can make little cowboy on the road kits for your guests. Include novelty cowboy items like the following used for prizes. fruit leather, licorice rope, bubble gum tape (in circular case), Wrigleys (wrangler's gum), jolly rancher candy, sunflower seeds, and jerky.